Half term feels like a distant memory. We took the girls away to France for fun and frolics on the beach. It was a blimming brilliant way to spend the half-term holidays but now we're back and on the downhill slope towards the long school summer holiday. This spring there are lots of holiday inspired activities to be found on the Peppa Pig grown-ups website. There are downloadable counting worksheets, i-spy travel kits, a recipe for homemade lemonade (perfect for sipping in the garden) as well as instructions for how to make your own paper kite. Not only are there plenty of Peppa Pig activities for your family to take part in, but this summer sees the launch of some special holiday essentials from Peppa Pig. First up is a new range of Peppa Pig toys with a holiday theme from theme parks to beaches, Peppa and George will be busy this summer. This Peppa Pig Jumbo jet really struck a chord with Holly having arrived just after we had returned from our own holidays on an aeroplane. 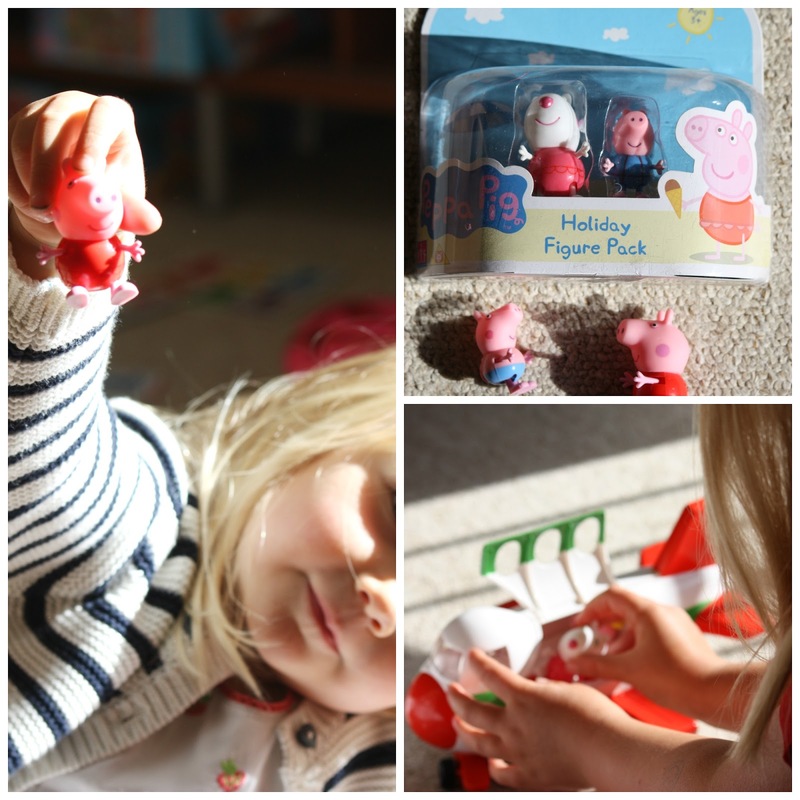 Holly has enjoyed packing Peppa's suitcases into the hold of the plan and then letting Peppa take turns acting as a passenger, or as the pilot in the plane. There are three seats in the plane so you can pair this Peppa Pig Jumbo jet with one of the two-packs of holiday themed collectible Peppa Pig figurines featuring your child's favourite stars in their swimming cossies! Also new in the Peppa Pig holiday range are these great travel accessories. This clever Peppa Pig travel pillow is reversible and turns into a soft cuddly toy. You can use the pillow to support your little one's head when on a plane or a long car journey. It is available in Peppa colours or George colours. Holly is just at the age now when she wakes from a sleep when travelling with an awfully sore neck so this will be perfect for our long drive up from Berkshire to Cumbria during the summer holidays. It has the added bonus that it can be used at bedtimes as a cuddly toy once you reach your destination! Also in the travel range is a handy car seat organiser. I've wanted a car seat organiser for some time because I know (having taken a fair few epic road trips over the last few summers) that my car normally fills up with food and drink debris, crayons, leapfrog games and i-spy cards. This Peppa Pig brightly coloured car seat organiser straps over one of the front seats of the car and straps in place. It has one large pocket with a transparent lining which could house a DVD player or a magazine or larger items such as tablets or games. Lower down there are pockets of several different sizes which can house pencils, paper, drinks and snacks to help you make it through your journey! And finally, to provide a little bit of in-flight entertainment, or an evening distraction when you are on your travels, these Peppa Pig travel colouring and re-usable stickers sets are a simple, light weight solution that you can put in your suitcase or hand baggage and use to keep the peace when you are travelling!